This simple dish is set off perfectly by plain boiled rice, which makes a good counterpart to the oil-rich fish. Stir some chopped fresh coriander leaves into the rice to give it a lift. Mackerel is available from the Fish Service Counter, where staff will clean and fillet it for you. Preheat the grill. Score the skin of the mackerel several times with a sharp knife. Combine the mustard and spices and rub all over the skin. 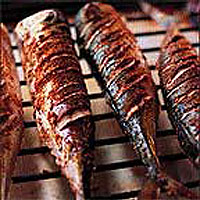 Grill the mackerel on a rack in a grill pan for 5-6 minutes each side, until cooked. Spoon the pan juices over (optional). This recipe was first published in Sun Sep 01 01:00:00 BST 2002.